Fr. Stephen Memnaugh from St. Francis Friends of the Poor NYC and Br. Ramon Razon from Broadway House NYC will speak about the Franciscan tradition and how the Church calls us to walk with people with mental illness and the people who love them. The meeting room where we will gather is Anthony Hall Founders Room. There are directions to our campus. Our address is 11401 Leesville Road Raleigh, NC 27613. My cell number is 919-630-6899. We will be gathering here around 6 or 6:15pm. You’re welcome to come at any time. Could you each share some information with me that can be used in your introduction? Please include your current title, how long you’ve been in that role, what brought you to the mental health/law enforcement field, and what keeps you there? We currently have 66 people signed up to attend. A press release was sent out Monday, so we hope to have between 50 and 100 people. The room is a large open space. There will be a raised platform (about 12 inches) where the panelists will be seated. We will have microphones and there is a projector if you have anything you’d like to share. If you have something to project, please email it to me prior to 3/1 so I can have it loaded. Also, we have a pretty picky firewall so email me separately so I can make sure we get it. Depending on the RSVP’s the audience will be seated around tables. There’s a spot on the registration form for people to share why they’re interested in this forum. Several folks have family members who are bipolar, some with depression, OCD, anxiety, poly-substance abuse. Several folks have had inpatient hospitalization experiences. Most have adult siblings or children they are caring for. Mental Health is an issue that affects 18% of adult Americans. In 2016, there were 43.6 million American adults with any mental illness (ami), while only 4% of Americans have serious mental illnesses (smi). To put these numbers in perspective, in 2017, there will be an estimated 1,685,210 new cancer cases diagnosed and 595,690 cancer deaths in the US. Heart disease will kill 370,000 Americans this year. Our faith teaches us to acknowledge our needs and to ask God’s help to live better lives. Until we can openly and honestly acknowledge that mental illness is a disease, that this disease affects us right here in North Raleigh, and that the people who live with mental illness deserve our compassion and care, we will continue to marginalize and isolate nearly one fifth of our community. You’re invited to join us for this two part series called Walking in Mercy – Living with Mental Illness. Together we can learn about the challenges and opportunities for those living with mental illness. This series on mental health is a collaboration of St. Francis’ Formation and Care and Wellness ministries. For further information, or if you are with the media and would like to interview the organizer’s of the series, please see below. 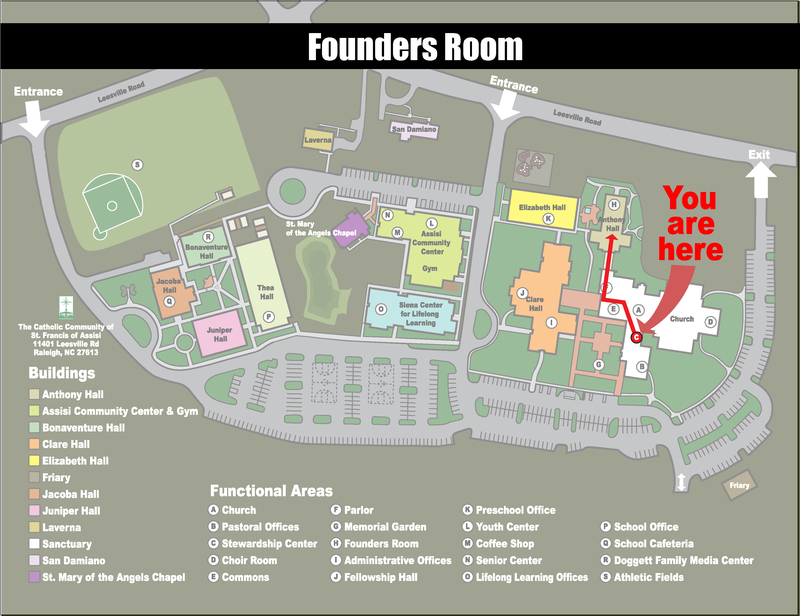 Event will take place in Clare Fellowship Hall see locator map and campus map below. Reach out to those who experience mental illness. Lift their burdens, calm their anxiety, and quiet their fears.Surround them with your healing presence that they may know that they are not alone. We ask this through the intercession of Our Lady of Lourdes and in the name of your Son, Jesus and the Holy Spirit, now and forever. AMEN.